We all love traditional English pancakes served with lemon and sugar, but for a change try these for a thicker, sweeter alternative. They are easy enough for kids to make with a little help and are great for weekend breakfast or as a dessert. Place the flour, baking powder, sugar, eggs and milk in a blender and process until smooth. Cover and place in the fridge for at least 30 mins. Place the berries, icing sugar and 1-2 tbsp water in a food processor and process to a smooth puree. Strain into a jug and sweeten with a little extra icing sugar to taste. Preheat a non stick frying pan until hot & add 2 tsps of oil. Pour in 2tbsp of the batter & cook until bubbles begin to appear. Turn the pancake. Cook for 1 min. Remove from pan and keep warm in a clean tea towel.Repeat until all the batter is used. 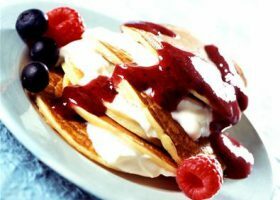 Serve warm pancakes, drizzled with fruit sauce and a dollop of Greek yoghurt or fromage frais sweetened with clear honey to taste.